I know that I'm not alone in my love of spending money - I take zero persuading in wanting to splash that cash - even when my bank account is seriously crying at me I just can't help myself. These days however, it is very rare that I spend anything on myself and when I do it's a very forced activity. But buying things for the kiddies, oooh well I love it - the things seem to just levitate towards me...it's effortless. Especially now that I'm allowed to go mad with all of the pretty pink, glittery, fluffy girly things - it's great. 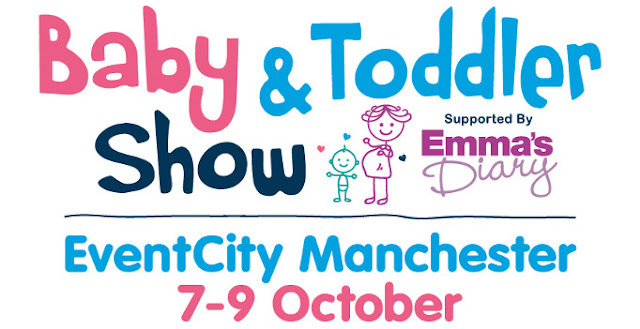 But danger is my middle name, so I'm doing it - I'm preparing myself and I'm ready to attend my first ever Baby & Toddler Show in Manchester this year. I had planned to go last year but decided I was a little too pregnant to chance it - there was a week to my due date - but I intend to make up for it this time round. And if you yourself fancy winning a ticket yourself to the show, well I have a pair to give away to one lucky person for the Manchester event being held over the weekend of 7-9 October 2016. You win, you pick your date - it couldn't be simpler. Oh and even if you don't win, don't fret - code BTN31 gets you a third off of adult tickets (under 16's go free) when you purchase your ticket. Aren't I (well, The Baby & Toddler Show) good to you.